Nugent-Hopkins spent two full seasons with the Red Deer Rebels from 2009-11. A highly-touted bantam player, Nugent-Hopkins was chosen first overall by the Rebels in the 2008 WHL Bantam Draft. As a 15-year-old affiliate player, Nugent-Hopkins made an immediate impact with two goals and six points over a brief, five-game stint during the 2008-09 season. In 2009-10, Nugent-Hopkins recorded 65 points (24g-41a) in 67 games to earn the Jim Piggott Memorial Trophy as the WHL’s Rookie of the Year. The following campaign, Nugent-Hopkins placed fourth in League scoring with 106 points (31g-75a) in 69 games and was named to the WHL’s Eastern Conference First All-Star Team. In his WHL career, Nugent-Hopkins collected 177 points (57g-120a) in 141 regular season games and amassed 13 points (4g-9a) in 13 playoff contests. The Edmonton Oilers selected Nugent-Hopkins first overall in the 2011 NHL Draft to make him the most recent of the eight WHL players that have been chosen first overall. Nugent-Hopkins is the only player to have been selected first in both the WHL and NHL Drafts. The 22-year-old forward is currently in his fifth season with the Oilers. In international competition, the Burnaby, BC product won a gold medal for Team Canada at the 2010 Ivan Hlinka Memorial Tournament and also represented Team Canada at the 2013 IIHF World Junior Championship and the 2012 IIHF World Championship as an 18-year old. Lysiak played three seasons with the Medicine Hat Tigers from 1970-73. His first season in the League was also the inaugural campaign for the Tigers. In 1971-72, Lysiak had a breakthrough campaign and was the top scorer in the WCHL with 143 points (46g-97a) in 68 regular season games. The 10-point performance by the WCHL First Team All-Star on December 30, 1971 is still tied for the most points by an individual in a single game. In his final year of junior hockey, Lysiak earned the WCHL Top Scorer Award and a WCHL First Team All-Star nod for the second consecutive season. Lysiak recorded 154 points (58g-96a) in 67 regular season games during the 1972-73 season before leading the League with 39 playoff points. The dynamic duo of Lysiak and Lanny McDonald guided the Tigers to a WCHL Championship in just the franchise’s third season. Throughout his WCHL career, Lysiak accumulated 327 points (118g-209a) in 195 regular season games and 51 points (19g-32a) in 24 postseason contests. Following his success in Medicine Hat, the Atlanta Flames selected Lysiak in the first round, second overall, of the 1973 NHL Draft. Lysiak played in the NHL for 13 seasons with the Flames and the Chicago Blackhawks. When Lysiak hung up his skates in 1986, he had registered 843 points (292g-551a) in 919 regular season games and notched 63 playoff points (25g-38a) in 76 outings. The product of High Prairie, AB also won a bronze medal for Team Canada at the 1978 IIHF World Championship. Moran topped the triple digit mark in points during three of his five seasons as a member of the Calgary Hitmen. The Abbotsford, BC native had a breakout campaign in 1997-98 as he buried 53 markers and was among the top 10 in WHL scoring. In 1998-99, Moran finished second in League scoring, behind his line mate Pavel Brendl, with 118 points (60g-58a) in 71 games. The CHL Third Team All-Star was also the runner-up in postseason scoring with 42 points (17g-25a) that year. On the back of Moran’s MVP performance in the WHL Playoffs, the Hitmen secured their first WHL Championship in franchise history. As a 20-year-old in 1999-2000, Moran earned the Four Broncos Memorial Trophy as WHL Player of the Year and the Bob Clarke Trophy as the League’s top scorer. 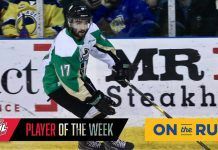 After tallying 120 points (48g-72a) in 72 games, Moran was chosen as a CHL Second Team All-Star as well as a WHL Eastern Conference First Team All-Star for the second year in a row. 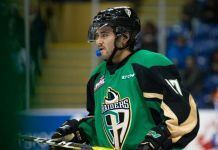 At the conclusion of his WHL career, Moran had registered 450 points (204g-246a) in 357 regular season games. Moran ranks third all-time in games played, 10th all-time in goals and 14th all-time in points. In addition, his 82 points (34g-48a) in 52 postseason contests are sixth all-time in the WHL record books. His jersey has since been retired by the Hitmen and now hangs in the rafters of the Scotiabank Saddledome in Calgary. The Buffalo Sabres selected Moran in the seventh round of the 1998 NHL Draft, but Moran played the majority of his professional career in North America with the Columbus Blue Jackets and the Vancouver Canucks organizations. The 36-year-old forward also spent four seasons in Sweden and is currently playing in the United Kingdom. Doan spent three seasons as a member of the Kamloops Blazers from 1992-95. The Blazers won the WHL Championship and the Memorial Cup in his second year in the League, but Doan suffered an injury and missed the entire postseason. Doan finished the abbreviated campaign with 48 points in 52 games. The Blazers repeated as WHL Champions in 1994-95 with Doan notching 94 points (37g-57a) in 71 regular season games before recording 16 points during the postseason run. Doan earned the Stafford Smythe Memorial Trophy as the MVP of the Memorial Cup after leading the tournament with nine points (4g-5a). Doan was also named a tournament all-star as Kamloops defended its Memorial Cup crown on home ice. At the conclusion of his WHL career, Doan had compiled 161 points (68g-93a) in 174 regular season games and another 17 points (6g-11a) in 34 playoff contests. Following his success in Kamloops, the Winnipeg Jets selected Doan in the first round, seventh overall, of the 1995 NHL Draft. Doan has played his entire 20-year NHL career with the Winnipeg Jets/Arizona Coyotes organization. The long-time captain of the Coyotes was recognized for his leadership abilities on and off the ice, as well as his contributions in the community, with the King Clancy Memorial Trophy in 2009-10 and the Mark Messier Leadership Award in 2011-12. The 39-year-old forward has collected over 900 points in more than 1400 regular season games so far in his NHL career. The Halkirk, AB native also has an impressive international resume playing for Team Canada with gold medals at the 2003 and 2007 IIHF World Championship and the 2004 World Cup of Hockey. In addition, he won silver medals at the 2005, 2008 and 2009 IIHF World Championship. In the fall of 2007, Doan became a part-owner of the Kamloops Blazers along with a group of other Blazers Alumni and majority owner Tom Gaglardi. Gallagher played four seasons for the Vancouver Giants from 2008-12. The determined sniper topped the 40-goal mark in three of those campaigns. In 2009-10, Gallagher had a breakout year with 41 goals and 81 points in 72 games. During the playoffs, the sophomore notched 11 goals and 21 points to lead the Giants to the WHL’s Western Conference Final. The following campaign, Gallagher was named a WHL Western Conference First Team All-Star after finishing eighth in League scoring with 91 points (44g-47a) in 66 games. In his final year of junior hockey, Gallagher received his second consecutive all-star nod as he netted 41 goals and 77 points in 54 games. At the end of his WHL career, Gallagher had recorded 280 points (136g-144a) in 244 regular season games. The native of Delta, BC holds the Vancouver Giants’ franchise record for most goals and points in a career. In addition, he tallied 36 points (19g-17a) in 42 total playoff contests. The 5-9, 180 lb forward was chosen by the Montreal Canadiens in the fifth round of the 2010 NHL Draft. The 23-year-old is currently in his fourth season with the Canadiens. Gallagher was also a member of Team Canada’s bronze medal-winning team at the 2012 IIHF World Junior Championship.